Steak and Lobster - eventually! 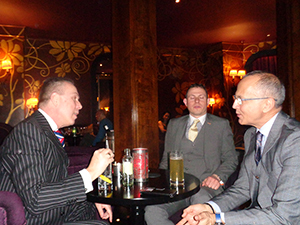 Our March 29th Social was at the Grafton Hotel on Tottenham Court Road. We had enjoyed a previous visit there and had particularly liked their spacious restaurant and adjacent bar, also the 'Steak and Lobster' menu is attractive. We were less keen on the hour long wait between sitting down for the meal and receiving the first morsel! Nevertheless, we were able to relax with drinks before, during and after the meal so all was well, and it was good to welcome a number of new members. Our February dinner and social took place at an interesting new hotel, L'Oscar, a few steps from Holborn tube station. It is apparently converted from a church but you wouldn't have guessed it from the smart and luxurious decor. There are two restaurants and two bars, but one of each were plenty for us, and we enjoyed a very good, reasonably priced 'pre-theatre' meal in Cafe L'Oscar (a very opulent cafe!). We then adjourned to the impressive circular bar, where we were made welcome by the staff. The great Oscar would have felt at home here! 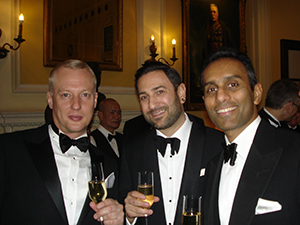 We were very pleased on February 15th to revisit the excellent and historic Cavalry and Guards Club in Piccadilly for a 'black tie' dinner where a record attendance enjoyed the Club's Champagne, followed by a splendid meal, all under the gaze of Field Marshals of the British Army whose portraits adorned the large room. We had been again welcomed by David Cowdery, the Club Secretary, who gave an interesting talk about these military dignitaries. A truly delightful evening! It was fitting that a year of record success for the Suit and Tie Society should culminate in our best attended event ever! 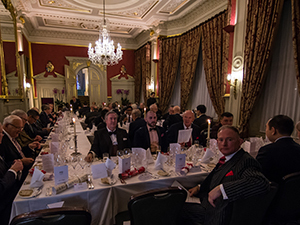 On December 15th 2018 this large gathering assembled in the splendid Marie Louise Room (see picture) of the Oxford and Cambridge Club for our 23rd Christmas Dinner. A pleasant surprise, though tinged with sadness, was a bequest from Henry, a popular member who died in 2017, which enabled us to enjoy the best Pol Roger champagne, before a traditional dinner which included roast turkey and all the trimmings, with Christmas Pudding to follow, ending with coffee, mince pies and port. 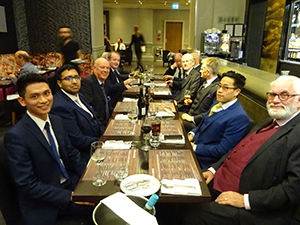 The Society’s Organiser, Robin, thanked Phillip who is also a member of the O & C Club for arranging the dinner so well, and said the efficiency of the staff concerned had been first rate. Members had once again been very generous with their gifts for the raffle, which without any membership fee is now our only source of income. He announced that the amount raised was by far the largest ever. 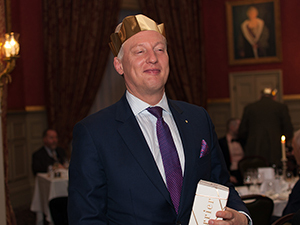 James (pictured) was obviously pleased with his prize, as were the numerous other winners, and the many messages of thanks afterwards testified to the undoubted success of the evening.